If you got your degree from the University of California, you might want to demand a refund. A newly surfaced video, recorded in October, shows Professor Ross Avila of UC-Merced teaching his class that 90% of terrorism in this country is carried out by âwhite Caucasian men.â I think he meant to say âwhite Christian men,â though itâs possible the professor doesnât understand redundancy. Avila was trying to demonstrate to his class that people use mental shortcuts when thinking about complex issues such as terrorism. Implied in his statement, of course, is the idea that most Americansâ mental shortcuts amount to blaming religious and racial minorities for what is really, according to Avilaâs made up statistic, a problem confined almost entirely to white men. This nonsense is gospel in left-wing circles. So now Avila has added two more demographic traits to his description. By his use of the word âusuallyâ he implies that more than half of white male terrorism is also âreligiously motivatedâ and conservative in nature. According to the professor, 90% of terrorist incidents are committed by white men, and some unspecified quantity more than half is religiously motivated and conservative. White, male, politically conservative, religiously-motivated terrorism must therefore comprise more than 45% and less than 90% of all terrorism in the United States. But heâs not saying that white men are evil. Those are just the facts, you see, and heâs a dispassionate observer. Professor Avila pulled all of those statistics out of his backside. Only a handful of terrorist acts are committed by perps who fit the entirety of Avilaâs description. Keep in mind, it isnât good enough to fit one or two characteristics. For Avilaâs stats to be correct he would have to show a plethora of terrorist acts carried out by people who are white, male, politically conservative, and religiously motivated. The only acts of terrorism I could find that fit Avilaâs description were a few small-scale incidents of anti-abortion terrorism. Such incidents shouldnât be hard to find, of course. Non-Hispanic whites made up 69% of the population in the 2010 census, and males slightly less than half of that. Approximately seven in ten Americans self-identify as Christian and nine out of ten believe in God. Thirty-eight percent of Americans describe themselves as politically conservative, the largest self-identifying political group. So if majority groups are carrying out the majority of terrorism in this country that shouldnât be a surprise. But they arenât. Luckily, Avila offered an anecdote to illustrate his point that white dudes are dangerous and the rest of us are bigots because we donât realize it. He described an incident that apparently happened âabout a month agoâ (which would have been September 2015), when a right-wing white guy took an AK-47 to the State Capitol building in Austin, Texas, and fired off sixty rounds before being arrested. He must have been a poor shot because no one was injured. âI think he was Christian,â said the professor. âIn fact, I know he was Christian because it was something about âthe state claimed it was Godâs lawâ and stuff.â The professor then asked the class how many students had heard of this incident. Only one hand went up, which was supposed to âproveâ that there was some kind of media blackout surrounding the Great Texas Capitol Shoot-em-up of 2015. That one student was certainly lying because this incident never happened. But think about how implausible his story is for a moment. How does one fire sixty rounds in a crowded building without hitting anyone? A blind man would have killed at least a few people. And how does one go on a sustained shooting spree in a government building teeming with cops and manage to fire sixty rounds before being stopped? Avilaâs story is absurdly absurd. My theory is that Avila, when confronted with his lie, attempted to find some incident somewhere that sounded like the incident he described and this was the best he could do. Dennis Marx is the professorâs shining example of a white, male, politically conservative, religiously-motivated terrorist. Or maybe he was just the closest thing the professor could find on the internet. Liberals are downright obsessed with conservative white Christian terrorists, so obsessed in fact that they try to mold every incident of terrorism into what they want it to be. The liberal media attempted to link both the Tucson and Aurora shootings to the Tea Party despite zero evidence. After the Boston Marathon bombing, MSNBCâs Melissa Harris-Perry shrieked that the bombers were âliterally Caucasian!â because they supposedly hailed from the Caucasus Mountains. (One brother was born there, the other wasnât.) Though racial categories are often hazy, I donât know anyone who would have considered the Tsarnaev brothers whiteâwhich is what Harris-Perry was implyingâbefore they started killing people. In any case, their race didnât drive them to terrorism; their religion did. These guys were Muslims and their religion was not incidental. If Smiley wants to educate himself on the Columbine Massacre I would recommend Dave Cullenâs superbly researched book âColumbine,â which I found to be even-handed and credible. He would learn that the killers were not Christians. Eric Harris was very much an atheist, even an anti-theist, and he recorded videos of himself before the attack in which he mocked the faith of his soon-to-be victims. On the day of the attack, Harris wore a t-shirt that read âNATURAL SELECTION,â a reference to his Darwinist outlook. Harris was fixated on the idea that some people are less fit than others and should be removed from the gene pool. He was just speeding the process along. Dylan Kleboldâs religious beliefs are bit more complicated. Raised by liberal baby-boomer parents, Dylan had little religious foundation. The Klebolds gave church a try for a short time when Dylan was a young child though they didnât stick with it. His journal revealed a tortured young man who believed in good and evil, light and darkness, though that alone did not make him a Christian. The two killers demonstrated their anti-Christian bigotry on the day of the massacre. One story that Cullen found lacking in credibility is that a Christian student named Cassie Bernall was interrogated about her religious beliefs before Eric Harris shot her under a table in the library. Her family and her church took the story and ran with it. According to Cullen, they have not wanted to give up their belief that Cassie was a Christian martyr. But Cullen concludes that the story was likely a case of mistaken identity. The Christian girl in question was probably Val Schnurr, who had already been sprayed with a shotgun. When she cried out, bleeding, âOh my God, oh my God, donât let me die!â Dylan Klebold asked her, mockingly, if she believed in God. She said yes. âWhy?â he replied. She said that thatâs the way she was raised. He loaded another shell and was about to finish her off when he got distracted and moved on. Cullen believes that some of the people in the library that day misperceived or misremembered that incident, likely because they were hiding under tables and in a panicked state of mind. But Tavis Smiley is convinced that Christians commit acts of terrorism âevery dayâ in this country. His only cited example was actually anti-Christian terrorism and it happened in 1999. Surely, if these incidents happen âevery dayâ he should be able to come up with something better and more recent than Columbine. Iâm sure that someone will be able to locate a terrorist incident that matches Professor Avilaâs description, thus âvindicatingâ his lurid imagination. But will even one or two incidents ever amount to the epidemic that liberals like to imagine? Is that number anywhere near 45%, which the professor clearly implied? No, but it helps liberals to talk constantly about a fraction of terrorists incidents, carried out by people liberals loathe, in order to distract us from the other incidents. Really, it all depends on how that catch-all word Terrorism is defined. Liberals define it as expression of non liberal opinions or as being Christian or Conservative or sometimes as being simply Not Liberal. If you got your degree from the University of California, you might want to demand a refund. A newly surfaced video, recorded in October, shows Professor Ross Avila of UC-Merced teaching his class that 90% of terrorism in this country is carried out by “white Caucasian men.” I think he meant to say “white Christian men,” though it’s possible the professor doesn’t understand redundancy. Avila was trying to demonstrate to his class that people use mental shortcuts when thinking about complex issues such as terrorism. Implied in his statement, of course, is the idea that most Americans’ mental shortcuts amount to blaming religious and racial minorities for what is really, according to Avila’s made up statistic, a problem confined almost entirely to white men. This nonsense is gospel in left-wing circles. So now Avila has added two more demographic traits to his description. By his use of the word “usually” he implies that more than half of white male terrorism is also “religiously motivated” and conservative in nature. According to the professor, 90% of terrorist incidents are committed by white men, and some unspecified quantity more than half is religiously motivated and conservative. White, male, politically conservative, religiously-motivated terrorism must therefore comprise more than 45% and less than 90% of all terrorism in the United States. But he’s not saying that white men are evil. Those are just the facts, you see, and he’s a dispassionate observer. Professor Avila pulled all of those statistics out of his backside. Only a handful of terrorist acts are committed by perps who fit the entirety of Avila’s description. Keep in mind, it isn’t good enough to fit one or two characteristics. For Avila’s stats to be correct he would have to show a plethora of terrorist acts carried out by people who are white, male, politically conservative, and religiously motivated. The only acts of terrorism I could find that fit Avila’s description were a few small-scale incidents of anti-abortion terrorism. Such incidents shouldn’t be hard to find, of course. Non-Hispanic whites made up 69% of the population in the 2010 census, and males slightly less than half of that. Approximately seven in ten Americans self-identify as Christian and nine out of ten believe in God. Thirty-eight percent of Americans describe themselves as politically conservative, the largest self-identifying political group. So if majority groups are carrying out the majority of terrorism in this country that shouldn’t be a surprise. But they aren’t. Luckily, Avila offered an anecdote to illustrate his point that white dudes are dangerous and the rest of us are bigots because we don’t realize it. He described an incident that apparently happened “about a month ago” (which would have been September 2015), when a right-wing white guy took an AK-47 to the State Capitol building in Austin, Texas, and fired off sixty rounds before being arrested. He must have been a poor shot because no one was injured. “I think he was Christian,” said the professor. “In fact, I know he was Christian because it was something about âthe state claimed it was God’s law’ and stuff.” The professor then asked the class how many students had heard of this incident. Only one hand went up, which was supposed to “prove” that there was some kind of media blackout surrounding the Great Texas Capitol Shoot-em-up of 2015. That one student was certainly lying because this incident never happened. But think about how implausible his story is for a moment. How does one fire sixty rounds in a crowded building without hitting anyone? A blind man would have killed at least a few people. And how does one go on a sustained shooting spree in a government building teeming with cops and manage to fire sixty rounds before being stopped? Avila’s story is absurdly absurd. My theory is that Avila, when confronted with his lie, attempted to find some incident somewhere that sounded like the incident he described and this was the best he could do. Dennis Marx is the professor’s shining example of a white, male, politically conservative, religiously-motivated terrorist. Or maybe he was just the closest thing the professor could find on the internet. Liberals are downright obsessed with conservative white Christian terrorists, so obsessed in fact that they try to mold every incident of terrorism into what they want it to be. The liberal media attempted to link both the Tucson and Aurora shootings to the Tea Party despite zero evidence. After the Boston Marathon bombing, MSNBC’s Melissa Harris-Perry shrieked that the bombers were “literally Caucasian!” because they supposedly hailed from the Caucasus Mountains. (One brother was born there, the other wasn’t.) Though racial categories are often hazy, I don’t know anyone who would have considered the Tsarnaev brothers white - which is what Harris-Perry was implying - before they started killing people. In any case, their race didn’t drive them to terrorism; their religion did. These guys were Muslims and their religion was not incidental. If Smiley wants to educate himself on the Columbine Massacre I would recommend Dave Cullen’s superbly researched book “Columbine,” which I found to be even-handed and credible. He would learn that the killers were not Christians. Eric Harris was very much an atheist, even an anti-theist, and he recorded videos of himself before the attack in which he mocked the faith of his soon-to-be victims. On the day of the attack, Harris wore a t-shirt that read “NATURAL SELECTION,” a reference to his Darwinist outlook. Harris was fixated on the idea that some people are less fit than others and should be removed from the gene pool. He was just speeding the process along. Dylan Klebold’s religious beliefs are bit more complicated. Raised by liberal baby-boomer parents, Dylan had little religious foundation. The Klebolds gave church a try for a short time when Dylan was a young child though they didn’t stick with it. His journal revealed a tortured young man who believed in good and evil, light and darkness, though that alone did not make him a Christian. But Cullen concludes that the story was likely a case of mistaken identity. The Christian girl in question was probably Val Schnurr, who had already been sprayed with a shotgun. When she cried out, bleeding, “Oh my God, oh my God, don’t let me die!” Dylan Klebold asked her, mockingly, if she believed in God. She said yes. “Why?” he replied. She said that that’s the way she was raised. He loaded another shell and was about to finish her off when he got distracted and moved on. Cullen believes that some of the people in the library that day misperceived or misremembered that incident, likely because they were hiding under tables and in a panicked state of mind. But Tavis Smiley is convinced that Christians commit acts of terrorism “every day” in this country. His only cited example was actually anti-Christian terrorism and it happened in 1999. Surely, if these incidents happen “every day” he should be able to come up with something better and more recent than Columbine. I’m sure that someone will be able to locate a terrorist incident that matches Professor Avila’s description, thus “vindicating” his lurid imagination. But will even one or two incidents ever amount to the epidemic that liberals like to imagine? Is that number anywhere near 45%, which the professor clearly implied? No, but it helps liberals to talk constantly about a fraction of terrorists incidents, carried out by people liberals loathe, in order to distract us from the other incidents. Of white terrorist attacks in the US, the overwhelming majority were carried out by people with LEFTIST leanings. Here's a partial list I've compiled over the past few years. "The woman accused of killing three colleagues at the University of Alabama in Huntsville [Amy Bishop] was a suspect in a 1993 attempted mail bombing, according to a report by The Boston Globe. The report broke the day after it was learned that Bishop fatally shot her brother in Braintree in 1986. ..."
From each according to his gullibility, to each according to his greed." In an article published this spring by Green Anarchy, a radical environmental newsletter, [unabomber Ted] Kaczynski calls on revolutionaries to "eliminate the entire techno-industrial system" by "hitting where it hurts" and disparages the activities of most radicals as "pointless." ..."
"The fall 2001 issue of Green Anarchy published a letter from Kaczynski complaining that Subcomandante Marcos, leader of the Zapatista rebels in Chiapas, Mexico, was insufficiently pure as a revolutionary because he advocates bringing water and electricity to peasants...."
"The Zapatista Army of National Liberation (El Ejercito Zapatista de Liberacion Nacional) is an anarcho communist army that is based in Mexico, mainly the poorest state in Mexico, Chiapas. In 1994, January 1st, they started their revolution and it has been increasingly successful throughout the years. Today, they are attempting non-violent struggles because the people told them too - they are truly an army of the people. However, both the people and their army are realizing how unsuccessful that tactic is. Their ideology, Zapatismo, is a mixture of indigenous teachings, autonomism, anarchism and communism. Although other revolutions are going on in the world (like the Southern African anarcho communist movement), the Zapatista revolution was deemed the first modern revolution of our time and it's bringing hope to people not only in Mexico, but around the world." 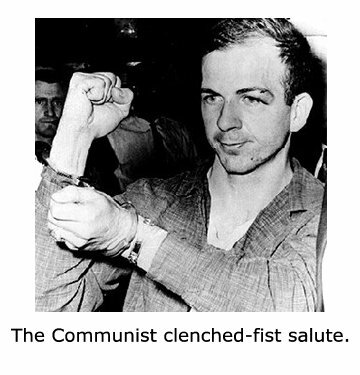 [Lee Harvey] Oswald was a dedicated communist who had defected to the Soviet Union in 1959 out of disgust with American capitalism. After becoming disillusioned with Soviet life, he returned to the U.S. in 1962. In early 1963, he bought a scoped rifle through the mail and soon used it to fire a shot (which missed) at retired general Edwin Walker, the head of the John Birch Society in Dallas. In the summer of 1963, Oswald was active in street demonstrations in support of Castro. In September 1963, he visited the Soviet and Cuban embassies in Mexico City seeking a travel visa that would allow him to travel to Cuba. Oswald was among the radicals of the time who saw Third World revolutionaries like Castro as the wave of the communist future. He was well aware of Kennedy's efforts to overthrow Castro's regime. As a Senate investigative committee suggested in 1975, Oswald shot Kennedy to interrupt his administration's plans to assassinate Castro or to overthrow his regime in Cuba. Ignoring Oswald's communist links, journalists and political leaders quickly claimed the president was a martyr to civil rights. Earl Warren said that Kennedy had "suffered martyrdom as a result of the hatred and bitterness that has been injected into the life of our nation by bigots." Martin Luther King said the assassination had to be viewed against the backdrop of violence against civil rights marchers in the South. James Reston wrote in the New York Times that "something in the nation itself, some strain of madness and violence, had destroyed the highest symbol of law and order." The consensus opinion was that Kennedy was a victim of hate and bigotry, a casualty of his support for civil rights. The Cold War and Kennedy's ongoing feud with Castro were rarely mentioned as factors behind the assassination. The reasons? Mrs. Kennedy wanted her husband remembered as a modern-day Abraham Lincoln. Lyndon Johnson feared complicating relations with the Soviet Union. Liberals feared a replay of the McCarthy period, when the Wisconsin senator inflamed public opinion about fears of domestic communism. He got off on the group's multiple explosions, too, and discusses them rather lovingly in his memoir. March 6, 1970: "three members of the Weather Underground accidentally killed themselves in a Manhattan townhouse while attempting to build a powerful bomb they had intended to plant at a social dance in Fort Dix, New Jersey -- an event that was to be attended by U.S. Army soldiers. Hundreds of lives could have been lost had the plot been successfully executed." "The bomb was intended to be planted at a non-commissioned officer's dance at Fort Dix, New Jersey. The bomb was packed with nails to inflict maximum casualties upon detonation." "The bomb preparations have been pointed out by critics of the claim that the Weatherman group did not try to take lives with its bombings. "The only reason they were not guilty of mass murder is mere incompetence. I don't know what sort of defense that is."" Opening arguments were presented on October 20, 2008. Assistant U.S. Attorney William Fitzpatrick said the defendants were inspired by jihad saying "Their motive was to defend Islam. Their inspiration was Al Qaeda and Osama bin Laden. "Kill all the rich people. Break up their cars and apartments. Bring the revolution home, kill your parents, that's where it's really at"
Article: "No Regrets for a Love Of Explosives; In a Memoir of Sorts, a War Protester Talks of Life With the Weathermen"
"Dig It. First they killed those pigs, then they ate dinner in the same room with them, they even shoved a fork into a victim's stomach! Wild!" "It was at the Chicago home of [Bill] Ayers and [Bernardine] Dohrn that Obama, then an up-and-coming 'community organizer,' had his political coming out party in 1995. Not content with this rite of passage in Lefty World - where unrepentant terrorists are regarded as progressive luminaries, still working 'only to educate' - both Obamas tended to the relationship with the Ayers." "In 1995, State Senator Alice Palmer introduced her chosen successor, Barack Obama, to a few of the district's influential liberals at the home of two well known figures on the local left: William Ayers and Bernardine Dohrn. ..."
"I can remember being one of a small group of people who came to Bill Ayers' house to learn that Alice Palmer was stepping down from the senate and running for Congress,"
"They're certainly friendly" -quote from 'Obama's chief strategist (and reigning expert on Chicago's political tribes), David Axelrod,' on the Bill Ayers, Obama relationship. Tavis Smiley is s lying anti-white bigot and a redistributions. It’s hilarious that this guy applies the same “religious and racial minority” mental shortcut that he’s warning his students about. White men are 30% of the US population. Thats a minority. White Christian men are a portion of that 30%, so even more of a minority. It kind of makes me wonder that, since liberals have this boogeyman under their beds, what would be their response to getting an actual boogeyman after them? For example, what if this dumbass started getting hate mail from Islamists, that blame him for every bad thing that happens to Muslims, and implying that he needs to be beheaded? After pooping in his pants, of course, he would probably curl up in a sobbing fetal position on the floor. The liberal idiot professor is a scoundrel simply because he's trying to call all violent criminal activities "terrorism" as long as they're committed by white males. If we can call all violent crimes terrorist activities, then Mexican-hispanics and blacks would have to be targeted. As an Hispanic male, Prof. Avila would have to condemn his own group, because Hispanic males commit a higher pct. of violent crime per capita than non-hispanic, white males. Basically, lib-leftist academicians go out of their way to avoid mentioning Islamic males. They cannot bring it upon themselves to attack fellow foes of Christian male-created western civilization. Even though violent Muslims would eagerly slit the throats of naive profs. like Avila. One little quibble...the two Tsarnaev bros were white...they were also Muslim fanatics. The latter had far more to do with their violent activities than their ethnicity. It doesn’t matter to people who make money demonizing white people and Christianity; they know the truth, but need a different “truth” for their agenda. White Christians, keep your powder dry; there isn’t even an attempt at honest dialogue at this point. “Professor” avila is a real piece of work. Someone throw his his completely worthless dissertation at his misshapen head. What an oaf.